MAGGIE'S PLAN is a delightful film that where's it's profundity lightly. Written and directed by Rebecca Miller, based on an unpublished story by Karen Rinaldi, it's basically a film that what happens after you marry the Manic Pixie Dreamgirl. That's the whimsical, pretty young woman that exists in many modern romantic comedies to allow the sad, depressed, trapped male hero to escape into a better happier world once the credits rolls. These poor girls - often played by through the ages by actresses like Audrey Hepburn, Jennifer Aniston, Zooey Deschanel, Natalie Portman or Cara Delevigne - don't really have an interior life of their own, or any kind of aims for their own life beyond rescuing their beloved men. This has been somewhat grating for female viewers, and presumably for the actresses themselves. And so we get the wonderful Greta Gerwig - who has played plenty of these supremely capable fixers of broken men and women in her time - as the lead character in this amazing film. She plays Maggie - a loving and lovely woman who decides she wants to have a baby despite not having a boyfriend. She gets an old college friend called Guy (Travis Fimmel) to be a sperm donor, but on the night she's going to do the deed ends up shagging a married college professor called John (Ethan Hawke) instead. Long story short, she decides to rescue him from his apparently horrendous high-maintenatnce super-successful wife (Julianne Moore), and they have a kid together. At this point the conventional rom-com ends. The real plan is then hatched when Maggie wakes up a year later and discovers that she's basically become a glorified nanny to her own daughter and her two stepchildren. Her husband, who complained so much about his ex-wife's neediness, is just as needy. She has enabled him at the cost to her own sense of self. And so the real plan, is to get John to leave her for his ex-wife. What I love about this film is that it's really funny - but not in a forced, smart-alecky way - in a way that finds the humour in the absurdity of everyday life. This is best encapsulated in the scenes between Maggie's married friends Felicia and Tony (Maya Rudolph and Bill Hader). They are funny, authentic, don't sugarcoat married life, but show has wonderful it could be. The movie also depicts the modern reality of blended families and the toll it takes on the kids lightly but realistically. There's a great one liner from John's daughter where she says, exhausted "I just want to know where my stuff is" as she's shuttled from house to house. 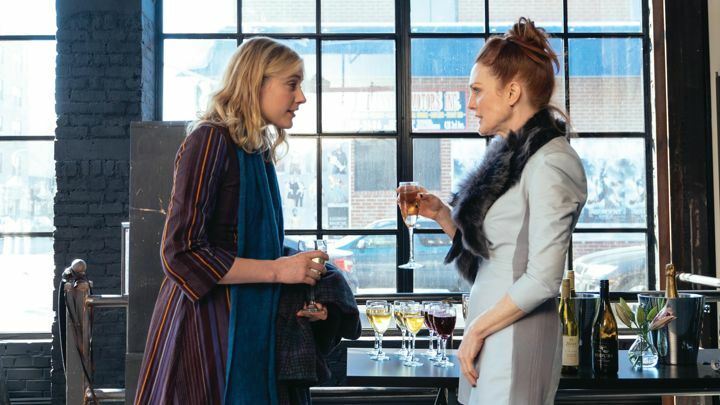 Ethan Hawke is superb as the selfish John, Julianne Moore is both hilarious and tragic as his ex-wife, but most of all this is Gerwig's movie. She's complex, loving, absurdly controlling and yet earnest and wonderful. In other words, rather than just being a 2-D manic pixie dream girl, she's a real woman with all the necessary contradictions, flaws and wonders. MAGGIE'S PLAN has a running time of 98 minutes and is rated R in the USA and 15 in the UK for strong language. The movie played Toronto 2015 and Sundance 2016 and opened earlier this year in France, the USA, Serbia, Switzerland, Macedonia, Canada, the Netherlands, Israel and Portugal. It opens this weekend in the UK and Ireland, next week in Taiwan, on July 28th in Greece, on August 4th in Germany and on October 21st in Estonia.